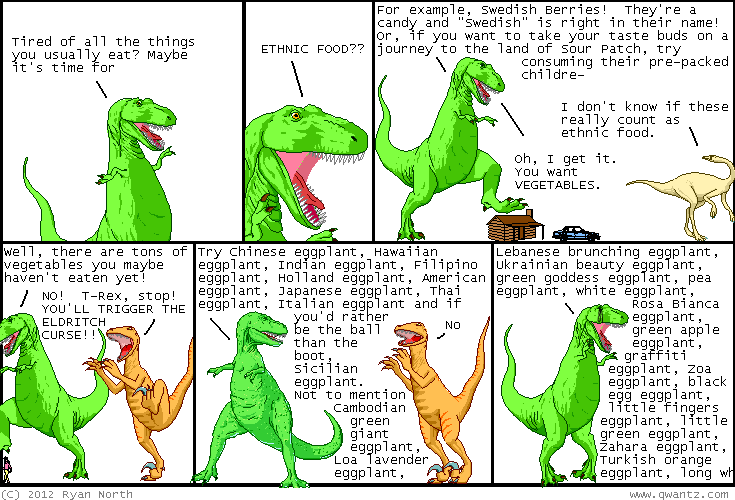 Dinosaur Comics - October 31st, 2012 - awesome fun times! –But we all remember him when we're hungry! October 31st, 2012: My physicist friend Ben Tippett, who you should remember from his amazing Unified Theory of Superman's Powers scientific paper, has done it again, just for you on Hallowe'en: Possible Bubbles of Spacetime Curvature in the South Pacific, or, in other words, A UNIFIED THEORY OF CTHULHU. Ben writes, "specifically, i was able to describe all of the crazy things which the sailor Johansen sees upon the corpse city of R’lyeh using my mad general relativity skills."